I have had this Thankful pillow by Erin at Porter Lane Home for a few seasons. I love it paired with this gray Ralph Lauren pillow I picked up from Home Goods. And the texture on this gray throw is just perfect! So cozy!! 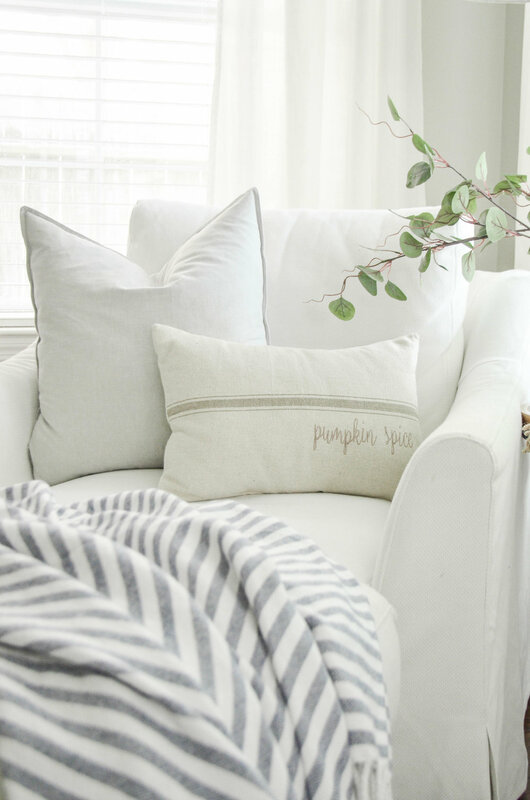 I love this combination of pillows because it is calm and neutral and oh so soothing. You may have already seen this combination as part of my Fall Home Tour. 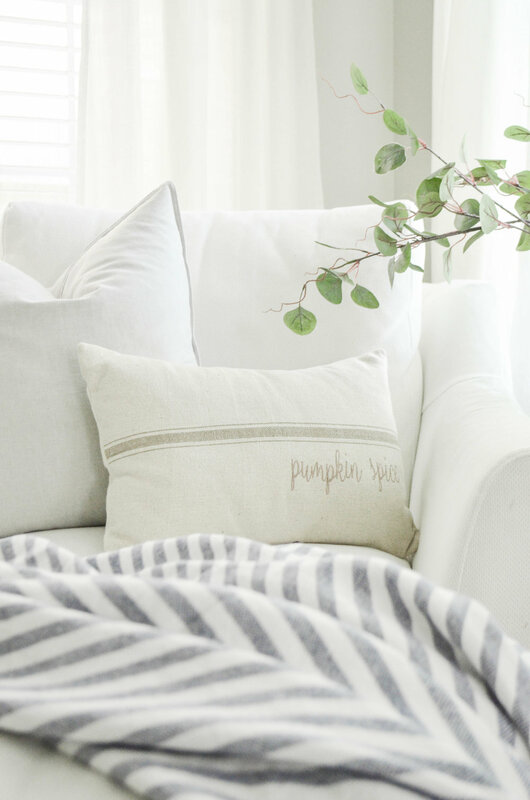 For this combination, I simply changed out my gray cable knit throw for this blue striped one and changed out my "Thankful" pillow for this charming farmhouse style Pumpkin Spice pillow by Farmhouse on Boone. I really love how the ticking stripe on the pillow gives the pillow such farmhouse charm. For this combination, I paired a gray buffalo check pillow cover from Ikea with my Thankful pillow and a cream cable knit throw. I love how the grays in the two pillow play off each other. This combo would look great with the gray cable knit throw, too. The thing about using a neutral palette is that you can mix and match and make so many combinations--and they all look great together! And for my last combo, I thought I'd throw in a pop of color! Ahahah! My family always laughs when I say black is a pop of color. I love the contrast the black buffalo check brings to this space. And this pillow is perfect for Halloween décor too! It always makes an appearance somewhere in the house when October rolls around. So what do you think? Which combination is your favorite? Check out these posts for more Fall inspiration!